1. Pay Your Bills On Time – Sounds easy, right? Your payment history is the single biggest factor in determining your credit score. If you are struggling making your payments on time, reach out to your lender and ask about alternative payment plans that could help you get back on track. Many also offer an automatic bill pay option that takes the money right out of your account on the due date. 2. Reduce Your Debt by Paying Down Your Larger Debts First – If there is any way possible, try and always pay more than the minimum payment amount. Start with the largest burden on you financially and try to get that one paid off first. Once you get that one tackled, move on to the next highest and continue that same process. Before you know it, you will have those high credit card balances paid. 3. Avoid New Credit – Only apply for new credit when you absolutely need it. The best way to boost your credit score is to keep revolving balances low and make all of those payments on time. If you are just starting to build credit, make sure you don’t open up too many accounts too soon. 4. Report Any Errors – You should review your credit report carefully for anything that you think could be wrong. Contact the credit bureau that sent the report in writing to correct any mistakes. Consumers should review their credit report at least once per year to identify mistakes or potential fraud taking place in your credit report. 5. 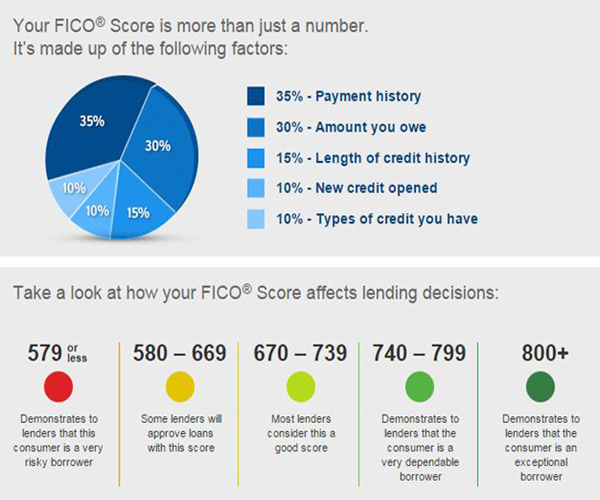 Limit Your Shopping for Credit – Inquiries in your credit profile can lower your score. When you decide it is time to go out shopping for a car loan or mortgage, try to limit your shopping and pulling of your credit to within 14 days. Any pulls on your credit within that time frame has a limited adverse effect. 6. Stability – Creditors like stability, so they do not like it if you move around or change jobs frequently. Have a verifiable address. They need to be able to open the phone book and verify the information on your application.